Nothing conjures up such quintessentially English images as the traditional English driven game shoot. With pictures of both landed gentry and aristocracy dressed in their customary tweed, lined up on their pegs as the whistle blows, stood with shotguns loaded and poised as the beaters flush the birds towards them – all are equal as that first high bird comes overhead! Your day will begin with you meeting one of the Athina representatives at the estate, where a safety briefing will be given. Depending on the shoot location, breakfast may also be provided beforehand in addition to a break for lunch and refreshments. We can offer single pegs to full days. Please see our availability or contact us for further information. Well presented driven pheasant and duck shoot within easy reach of London. Catering/hospitality provided. Each day is for 10 guns. Please contact us to discuss availability for the 2017/18 season. Pheasant: Oct 1 – Feb 1 inclusive. Partridge: Sep 1 – Feb 1 inclusive. Snipe: Aug 12 – Jan 31 inclusive. Woodcock: Oct 1 – Jan 31 (England) and Sep 1 – Jan 31 (Scotland) inclusive. Swathed in good old English tradition and formality, a day’s driven game shooting is not to be missed. 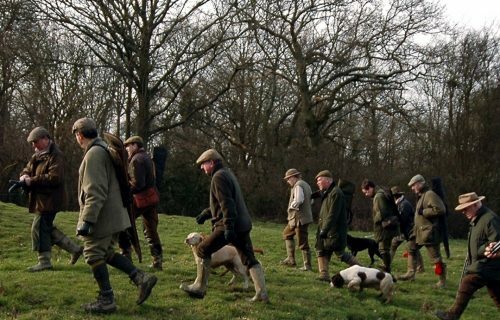 English driven game shooting is often shrouded in layers of etiquette and tradition. Whilst there is an element of this to the driven game shoot, it needn’t be as daunting as one may anticipate! There are a few simple rules to follow to maintain face on a shoot. The first is safety. If you are an unsafe shot, you will not be welcome or made to feel welcome. You will almost certainly be asked to leave. Practice safe shooting and you are on the right path. Dress appropriately. Clay shooting vests or camouflage are not suitable attire on a driven shoot. Use a cartridge bag for your cartridges and a gun slip for your gun when not in use. Tweed or muted colours are appropriate clothing choices. Wellington boots are a must, but you may arrive in brogues or similar footwear and change upon arrival. A country shirt and tie are essential on most shoots, but it is optional whether you choose to match your gaudy shooting socks to your tie colour! A tweed jacket and flat cap will finish off your look perfectly. Most essentially – dress to be warm and dry, as you shan’t have a good time if you’re uncomfortable. If you are bringing your own dog, be sure that he or she is well trained. You may wish to have a loader present. This can be arranged via ourselves if you wish. It is always appreciated if you collect any birds close to you at the end of a drive and place them on the cart. Help doesn’t go unnoticed. Respect your quarry. Don’t carry game by the feet. Always carry game by the neck. If a bird requires dispatching, do so with a priest and never by swinging or hitting the bird against an object or the ground. Do not allow your dog to chew game. A good gun always tips the keeper. £20 is a good starting point, plus an extra £10 per hundred birds. But check with the host what is the ‘expected’ amount to be certain. Also remember to thank all the staff involved in the shoot itself, such as the beaters and pickers up. Don’t run out of cartridges. Take more than you expect to use. Don’t shoot any other quarry other than what is specified in the briefing. Prices start from £350 for a single peg, with entire days available for purchase – please contact us to arrange your peg today.